Len Saunders is an immigration lawyer practising in Blaine, Washington, a busy port of entry for British Columbians headed to the U.S. He said that while instances of Canadians being denied entry for smoking marijuana were once rare (he estimates he looked at only a few cases per year as recently as 15 years ago) they're much more common now. He said he now manages one to two such cases per week. And naturally, with legal marijuana now just months away, the question could start coming up at the border a lot more often. "When Trump talks about building a wall on the southern border, I see a wall on the northern border for Canadians because of marijuana. There's a brick wall going up on the northern border for Canadians if they answer truthfully whether they have smoked marijuana," Saunders said during a recent appearance at a Senate committee studying the matter. While some U.S. states have dismantled prohibition — including Washington, a border state — possession remains a criminal offence federally. And the U.S. border is, of course, governed by federal law. "Although medical and recreational marijuana are legal in some U.S. states and Canada, the sale, possession, production and distribution of marijuana remain illegal under U.S. federal law," Jason Givens, a public affairs specialist with U.S. Customs and Border Protection, said in a statement. "Consequently, crossing the border with marijuana is prohibited and could result in fines, apprehension, or both." The government of Canada has started warning travellers on its website that "previous use of cannabis, or any substance prohibited by U.S. federal laws, could mean that you are denied entry to the U.S." Involvement in the legal cannabis industry in Canada could also be reason enough for border guards to deny entry. Entry happens at the sole discretion of the U.S. Customs and Border Protection officers on duty — and they have a lot of latitude to ask questions to determine the admissibility of a foreign national. "What they do is they interrogate you. They tell you that if you don't tell them the truth, they're going to do a drug test on you. They can't do that," Saunders said. "They tell you they're going to do a lie-detector test. They can't do that. They tell you they will hold you indefinitely or possibly arrest you for not telling the truth. They can't do that. "I see this intimidation. People eventually break down and they admit to it. So these people become a client for life." Lorne Waldman, one of Canada's top immigration lawyers, said that while the cannabis question likely won't be asked of every Canadian cross-border traveller, it's reasonable to expect to hear it more often after Canada's legal marijuana market is in place. "If somebody asks, then a Canadian could be barred for life. That's the situation we're confronted with now," he said. Public Safety Minister Ralph Goodale said Ottawa has kept the U.S. government in the loop throughout the legalization process, explaining to its officials that importing or exporting cannabis will remain illegal. The border prohibition applies even to Canadians authorized to use cannabis for medical purposes — and to people travelling to or from parts of the United States where cannabis has been legalized or decriminalized. "There should be no reason for them to change their basic questionnaire when someone approaches the border to cross. They agreed with that proposition," Goodale in an interview with CBC's Power & Politics on Thursday. "They say they do not plan to change the questionnaire but, as in all circumstances, if there is something that raises a suspicion on their part, if there is some behaviour, or some aroma, or if they find someone with residue in their pocket or something, that would obviously raise a suspicion and would be grounds for secondary questioning. "Assuming that Canadians are not behaving in a way that raises that doubt, or that suspicion, the questionnaire should not change." 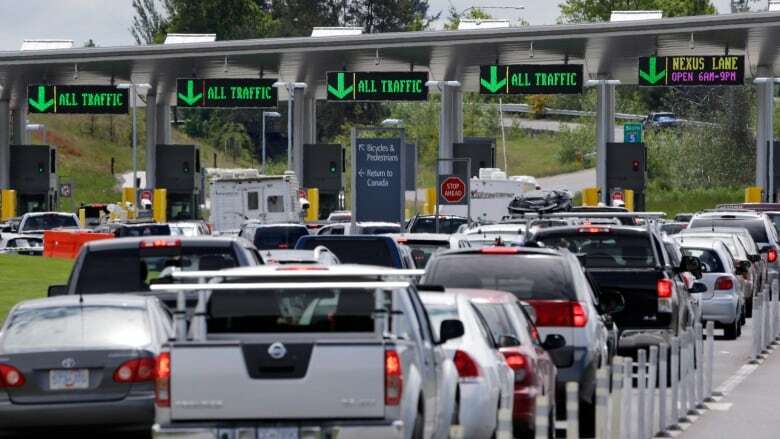 The federal government will post signs at border crossings warning Canadians not to bring their legal marijuana into the U.S. — just as the Americans do for their citizens with signs informing them of Canada's strict firearms regime. It's a move that could prevent some headaches for Canadians, said John Hudak, a director at the Center for Effective Public Management at the Brookings Institution and an expert of marijuana policy. He also suggested that Canada could install "amnesty boxes" at border crossings — places where Canadians can deposit their marijuana before travelling south. "The best way for Canada to deal with this issue is to be proactive. Designing information campaigns in dispensaries, on roadways near airports and borders, and in airports themselves, is an important step," he said. "These efforts will not be perfect, but they will help individuals who are genuinely unfamiliar with policy, or will help motivate people to do the right thing."